Stars: Lawrence Tierney, Claire Trevor, Walter Slezak, Elisha Cook Jr. When the work of Robert Wise comes to mind, it's not necessarily as a director of film noir�we associate him more often with great big movies like West Side Story and The Sound of Music, but earlier, in movies like this one and The Set-Up, he proved that he could make pulpy, streetwise pictures just about as well as anyone. 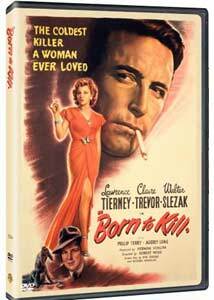 Born to Kill has enough plot twists and improbable coincidences to pad out a couple of silent movies or a few months' worth of a daytime soap opera, but we come to accept that this is the world we're in pretty quickly, and Wise and his collaborators take us along on a moody, suspenseful and stylish ride. The action starts in Reno, with the ink on Helen Brent's divorce barely dry; she's ready to leave town as soon as she can, finally a free woman. Helen gets a glance at the aptly named Sam Wilde at a local casino; he's at the craps table, and she unwisely bets against him. But she's just a temporary distraction for Sam, whose eye is on Laury Palmer, a boozy divorc�e of rather easy virtue; Laury's next-door neighbor and frequent drinking buddy is Mrs. Kraft, who runs the rooming house where Helen stays during her necessary stint in Nevada. (Yeah, you can't tell the players without a scorecard with this one.) Sam sees Laury taking home a man, and before they can get horizontal, Sam kills them both�unfortunately for her, Helen discovers the bodies, but decides to get out of town before saying a word. And wouldn't you know it, but they become a couple of strangers on a train�Sam, the murderer, and Helen, the witness, find themselves on the same railroad car going from Nevada to San Francisco. We learn all sorts of things about them, good and bad, depending on your perspective�Helen has a fianc�, who's rich; also a foster sister, also rich and single; and Sam has Marty, his apologist and enabler for Sam's unfortunate habit of killing people who set off his temper. The plot turns here can be truly dizzying�have I mentioned the private detective that Mrs. Kraft hires to track down the murder of her friend? (Perhaps David Lynch is a fan, because the question that everyone but Sam, Helen and we are asking is: Who killed Laury Palmer?) Wise keeps these many balls in the air, and he's blessed with a gifted and mesmerizing cast. Lawrence Tierney is equal parts menace and charm as Sam; he's dashing, but he's a psycho, and we believe him in both aspects. Claire Trevor is called upon to do quite a bit of lip quivering as Helen, but she pulls it off with aplomb; there are some great smaller performances, too, especially from Elisha Cook Jr. as Marty, who seems half in love with Sam himself, and Esther Howard as Mrs. Kraft, as devoted to drinking beer as the most ardent fraternity brother. Image Transfer Review: Some of the images are sharp, but there are resolution problems�plaids on the ladies tend to shine, and there are occasional shots that look a whole lot worse, the victims of bacterial decay. Audio Transfer Review: Audio quality is uneven and frequently raspy; lots of static on this track, too. Extras Review: Noir historian Eddie Muller provides a strong and informative commentary track, in which he talks us through his obligatory nine classic stages of noir, and is especially good on the history of RKO, where this film was produced; he even includes a jokey story about Lawrence Tierney, later in life, taking a shot at him. Occasionally intercut with Muller are observations from director Robert Wise, who frequently sounds short of breath, though he remembers this picture with fondness. Also, the running time listed on the back of the DVD case is off by about ten minutes. A labyrinthine noir plot with style to burn makes up for some of the technical deficiencies of the print�Robert Wise and his cast seem to have had a hell of a fun time making this one, and watching it, you will too.